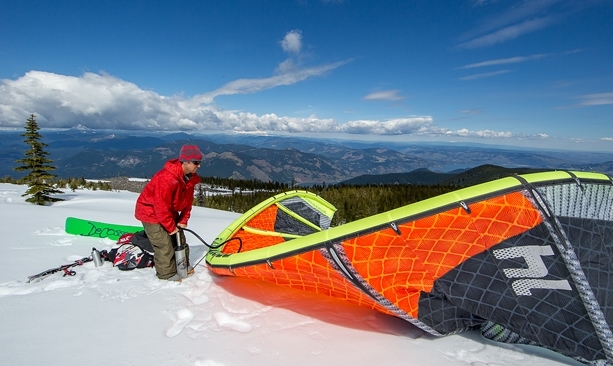 Snow kiting in the Cascade Range is limited by the fact that most of the snow falls above 5,000 feet and is, therefore, difficult to reach. Eventually, I realized that a snowmobile could get me to previously inaccessible locations, even Mt. Defiance. The pristine snowfield had the wind I was looking for, so I rigged my 11-meter kite, strapped on my snowboard and went for a wind-powered ride across Mt. Defiance’s ridgeline. On Mt. Defiance, I found myself simply cruising around while taking in this new view of the Columbia River Gorge and the surrounding mountains. It doesn’t matter if you find perfect conditions every time, but when everything comes together and you are able to snowboard up a mountain with a fresh coat of powder, using the power of wind, few things compare. I have biked and hiked these mountains over the years, but from this perspective, it all looked completely different. Best of all, my two-year mission to snow kite the top of this mountain was complete. Sometimes the fun is more about the spirit of exploration than the session itself. 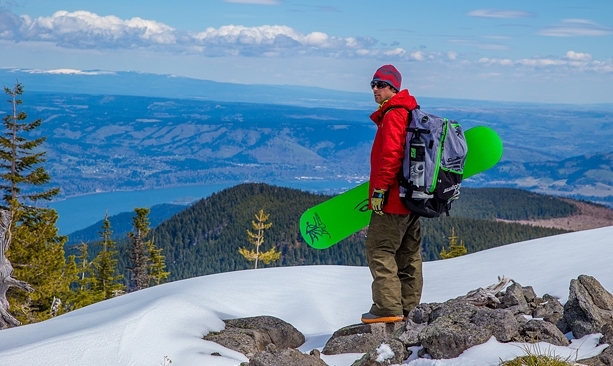 As a lifelong skier, snowboarder and recreational windsurfer, I was drawn to Hood River for its epic outdoor recreation. Where else can you ski on a glacier in the morning and windsurf the famous Columbia River Gorge thermals in the afternoon? I first witnessed the then emerging sport of kiteboarding in Hood River in the 1990s. Flying a parachute-size kite attached to 100-foot lines on a control bar, a rider would speed across the river on a surfboard. When I saw one of the first professional kiteboarders jump 30 feet in the air for a five-second hang time, all the while flipping and spinning, I thought, “Sign me up!” After a few lessons, I was hooked. Soon I found myself wondering if I could use a kite to pull myself around the mountains on a snowboard. A quick trip to Palmer Glacier on Mt. Hood proved that it was a great idea. The power of the kite was so intense, I was able to ascend the hill faster than on a high-speed chairlift — with no lift ticket required. 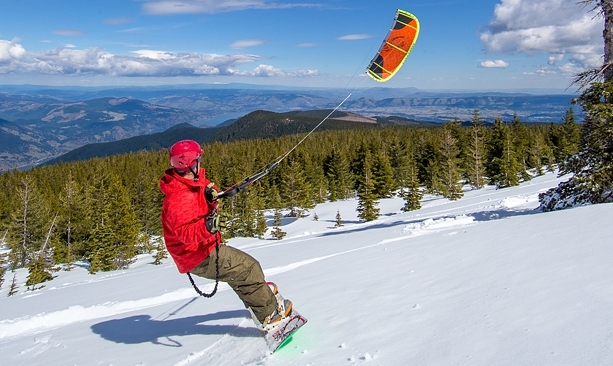 During the next few years, snow kiting grew in popularity. While most people aimed for wide-open frozen lakes, I was interested in exploring the mountains. Some days I’d travel more than 50 miles across the snow-covered rolling hills with my kite. 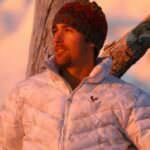 On others, I’d use the kite to ascend a peak, then store it in my pack and snowboard down, over and over again. Over the next 14 years, I explored the western United States, Alaska, Canada, Europe and New Zealand, searching for ideal snow-kiting locations. Recently, I’ve been on a mission to discover superior destinations closer to home. In Hood River, I wake up every morning to a view of Mt. Defiance just 10 miles west of town. 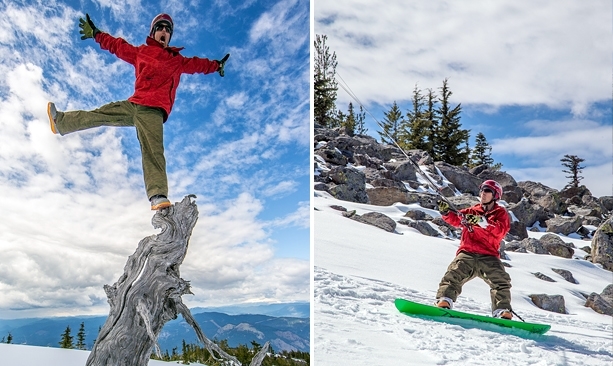 The 4,920-foot peak is seldom traveled in the winter but offers some of the most amazing views of Mt. Hood, Mt. Adams, Mt. Saint Helens and Mt. Rainier. 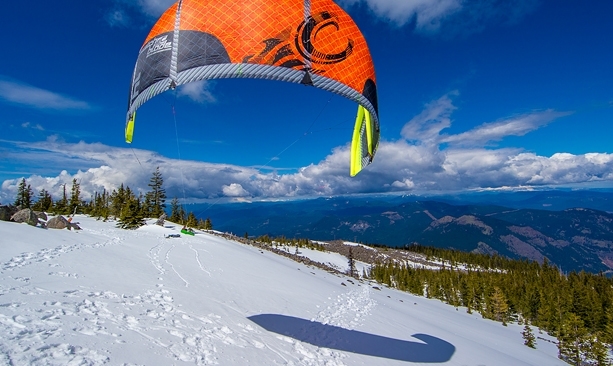 Snow kiting in the Cascade Range is limited by the fact that most of the snow falls above 5,000 feet and is, therefore, difficult to reach. Eventually, I realized that a snowmobile could get me to previously inaccessible locations, even Mt. Defiance. I scouted the area with Google Earth, and after a few trips to the summit on my snowmobile, I discovered a snowfield about five times the size of a soccer field. When the wind, snow and visibility finally lined up for ideal conditions to attempt kiting the north-facing summit of Mt. Defiance, I rallied Gorge photographer Richard Hallman to join me for the day’s adventure. We loaded up the snowmobiles with kites, snowboards and photo gear, then navigated up the network of rugged snow-covered roads that lead to the summit. The open mountain face we were searching for was a 300-meter descent through the trees. We trusted our GPS to guide us to the area. Hallman and I threw on our packs, strapped on our boards and dropped in for some backcountry powder turns through the tight trees. The slope finally opened up into one of the most spectacular views I’ve ever seen: the winding Columbia River cutting through the Gorge, surrounded by the tallest snowcapped peaks in the Pacific Northwest. Everything I’d hoped for was right in front of me. The pristine snowfield had the wind I was looking for, so I rigged my 11-meter kite, strapped on my snowboard and went for a wind-powered ride across Mt. Defiance’s ridgeline. 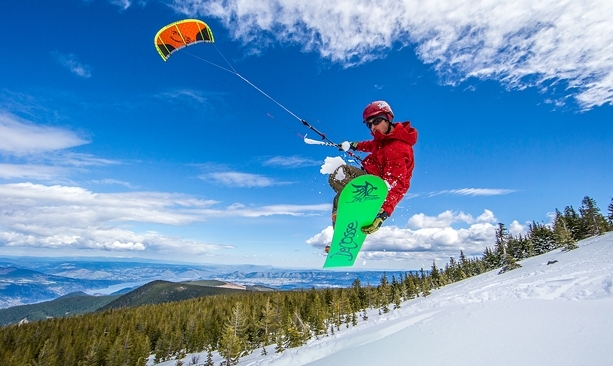 My snow-kite sessions are often about jumping as high as possible or exploring vast expanses, but on Mt. Defiance, I found myself simply cruising around while taking in this new view of the Columbia River Gorge and the surrounding mountains. I have biked and hiked these mountains over the years, but from this perspective, it all looked completely different. Best of all, my two-year mission to snow kite the top of this mountain was complete. Sometimes the fun is more about the spirit of exploration than the session itself. That’s what I love about snow kiting. It doesn’t matter if you find perfect conditions every time, but when everything comes together and you are able to snowboard up a mountain with a fresh coat of powder, using the power of wind, few things compare. Aaron Sales recently founded Global Sessions, an events business that showcases recreation in Hood River.